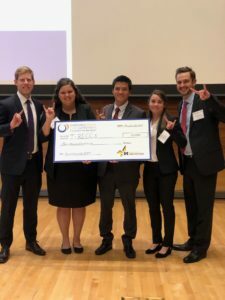 ANN ARBOR — A team of 5 McCombs cleantech MBA students won 2nd place in the Renewable Energy Case Competition (RECC) hosted by Michigan’s Ross School of Business. The team of Topher Lancaster, Sarah Pendergast, Carlos Villanueva, Brittney Boucher, and Nick Wright were selected from a field of 32 teams from top MBA programs across the country to present in the semi finals. “It was a great experience to be selected and get to meet so many fellow MBA students from across the country who shared our passion for clean energy!” said Nick Wright, MBA class of 2020. A panel of judges from Consumers Energy, DTE, EDF Renewables, Marathon Capital, Deloitte, and Schneider Electric selected 4 teams to continue on to the final round and ultimately selected the winning teams. The McCombs “T-RECCs” were proud to earn 2nd place overall and further cement McCombs as a leading renewable energy and cleantech MBA program. The case was an investment pitch for a real company that would best capitalize on the recent legislation in the state of California to move to 100% clean energy by 2045. The McCombs team presented on Advanced Microgrid Solutions, a company that specializes in software used to optimize energy storage and improve overall grid performance. This turned out to be a popular selection as both the first and second place teams presented on making the same investment. The McCombs team previously earned 2nd place in 2017 as well, see this post for details.